Welcome Prof. Kaisheng Chen from Guizhou University to be committee member! 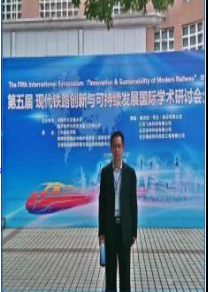 Chen Kaisheng, male, born in 1975, professor of Guizhou University, Ph.D., doctoral tutor, chief engineer of Guizhou University of Technology Civil Engineering Testing and Testing Co., Ltd. Member of the Working Committee of the China Highway Society. Engaged in teaching, research and social service in the direction of road engineering, geotechnical engineering and tunnel engineering. He has presided over 2 projects of the National Natural Science Foundation and 7 provincial and ministerial projects. Completed a number of pile foundation inspection, tunnel construction quality inspection and tunnel monitoring measurement projects. In the past 5 years, he has published more than 50 papers in core journals such as Geotechnical Mechanics, Journal of Chang'an University (Natural Science Edition), Highway Traffic Science and Technology, Highway, Chinese and Foreign Highways, Hydrogeology and Engineering Geology, among which more than 10 papers have been published by EI. Published 4 books.